Irma somehow spared Antigua, which was open for business by Thursday morning. 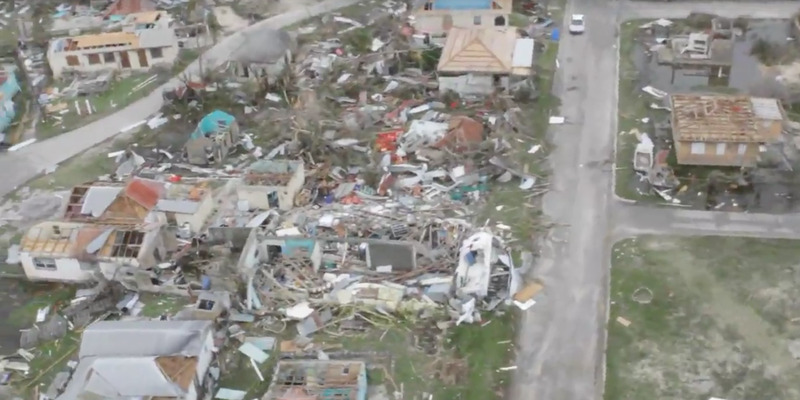 But on Barbuda, the smaller of the two islands with an area of 62 square miles, the ferocious and historic Category 5 hurricane had turned the typically gentle Caribbean winds into violent gusts that decimated Codrington, its sole town. Browne said nearly all of the government and personal property on Barbuda was damaged — including the hospital and the airport, which he said had its roof completely blown away. At least one person, a young child, was killed on the island — one of numerous deaths reported across the Caribbean in Irma's horrific aftermath. Now, these victims face yet another threat — a second hurricane, Jose, which appears to be coming for the same islands that are trying to dig out from Irma's devastation. The National Hurricane Center released an ominous bulletin Thursday about the new menace looming in the Atlantic: “...JOSE BECOMES 3RD MAJOR HURRICANE OF THE 2017 ATLANTIC SEASON...” By late afternoon, Jose had gained Category 3 strength, and Antigua and Barbuda remained in hurricane watch status. “We are very worried about Hurricane Jose,” Browne said Thursday in a phone interview with The Washington Post, adding that Irma left about 60 percent of Barbuda's nearly 2,000 residents homeless and destroyed or damaged 95 percent of its property. Browne will make a determination by Thursday night about whether to order a mandatory evacuation ahead of Jose's potential landfall, but added that those who want to leave Barbuda now are being ferried to nearby Antigua. As Irma continues its merciless churn toward the U.S. mainland, the first islanders left in its wake are only beginning to decipher the scope of the storm's ravages. After first making landfall in Barbuda, then strafing several other Leeward Islands, Irma raked the Virgin Islands and Puerto Rico, leaving nearly 1 million people without any electricity. The Dominican Republic, Haiti and the Turks and Caicos Islands are next in its path. Closer to Florida's southern tip, the Bahamas remain in danger, and mass evacuations are underway. It is, he said, “one of the most significant disasters anywhere in the world” on a per capita basis: Browne said it would take an estimated $100 million to rebuild — a “monumental challenge” for a small island government. When Craig Ryan, a 29-year-old tourism entrepreneur who lives in Antigua, reached Barbuda by boat Thursday morning, residents lined the beach waiting for rescue. "It's such a level of devastation," he told The Post, "that you can’t even see structures standing." Ryan’s family business, Tropical Adventures Antigua, dispatched a 75-foot motorboat to make the 90-minute passage between islands to ferry people off Barbuda before Jose's potential arrival. Some residents remain stuck in isolated areas blocked by impassable roads, he said by telephone as he loaded up water and other supplies at a dock in Antigua. "We really are in a rush against time," Ryan said. The Dutch government said that it was sending two military ships carrying smaller emergency boats, ambulances and emergency equipment to St. Maarten. French Interior Minister Gerard Collomb said 100,000 rations — or about four days' worth of food — are en route to the victims to St. Barts and St. Martin, which could experience tropical storm conditions from Jose on Saturday, according to the National Hurricane Center. The tropical storm watch also applies to St. Maarten, Anguilla, Montserrat, St. Kitts, Nevis, Saba and St. Eustatius. Britain's international development secretary, Priti Patel, announced Wednesday that the British navy, along with several Royal Marines and a contingent of military engineers, had been dispatched to the Caribbean with makeshift shelters and water purification systems. While some in England criticized the response, McKendrick told The Post that he's worried that they, too, will quickly become overwhelmed by the amount of work that must be done to restore a sense of normalcy. Elsewhere on Anguilla, some informal reports were less bleak. The Facebook page for Roy's Bayside Grill, for instance, remained active as Irma passed. Phone lines to the restaurant appeared to be down by the afternoon, and messages left with the Facebook page's administrator were not immediately returned. Michael Birnbaum and Annabell Van den Berghe contributed to this story from Brussels. Joshua Partlow contributed from Mexico City. Cleve Wootson and J. Freedom du Lac contributed from Washington. This post has been updated.